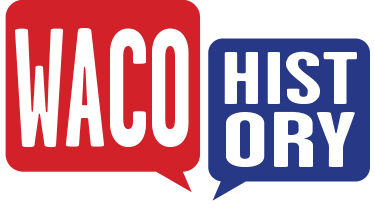 On May 31, 1851, four charter members established the First Baptist Church of Waco. These members reached out to prominent missionary and Texan Rev. Noah T. Byers, offering him a salary of seventy-five dollars per year to pastor the church. 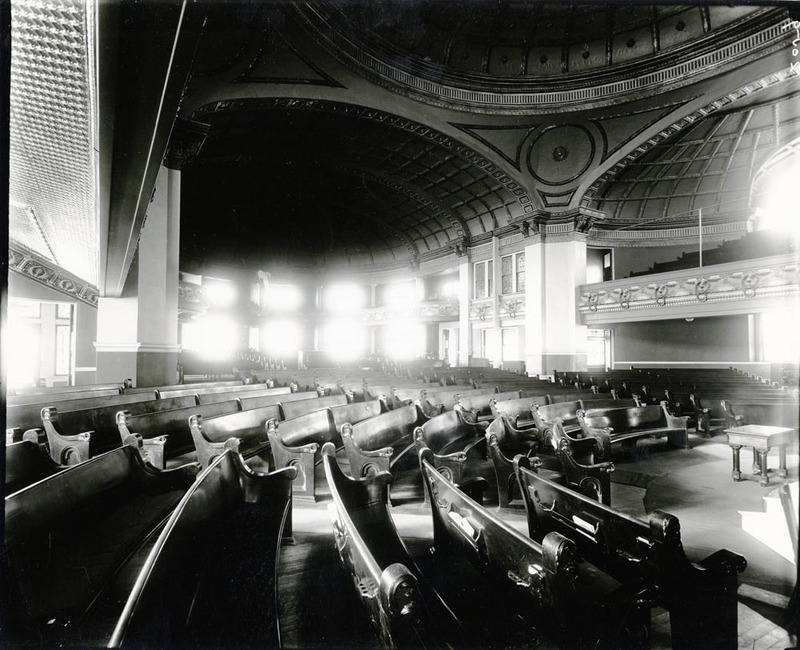 The church initially was composed of only fifteen members and met in the meeting place of the First Methodist Church until obtaining a brick building of their own at Fourth Street and Mary Avenue in 1857. The construction of this first building was a community effort. Church member B. D. Arnold provided the brick from his own brick-laying company, and committees within the congregation ensured that the church’s basic needs such as lamps and pews were fulfilled. When completed, the church was one of the most impressive structures in Waco at that time. A fire demolished the brick structure in 1877, and construction on a new church began almost immediately. Though the building efforts were not completed until 1883, the base floor was finished by 1880 and in use by the congregation for worship. At this time the church entered a period of innovative change under the leadership of B. H. Carroll. For the first time, women were allowed to serve as deacons in the church and worshippers implemented the use of musical instruments in their services. Carroll was known throughout the Baptist community for his profound theological knowledge and fierce leadership style. In 1870, the congregation appointed him pastor after he gained recognition in the local community for a revival hosted at New Hope Baptist Church earlier that year. He regarded his position as pastor as a commitment to be deeply honored and missed only one Sunday service throughout his time as pastor at First Baptist Church. 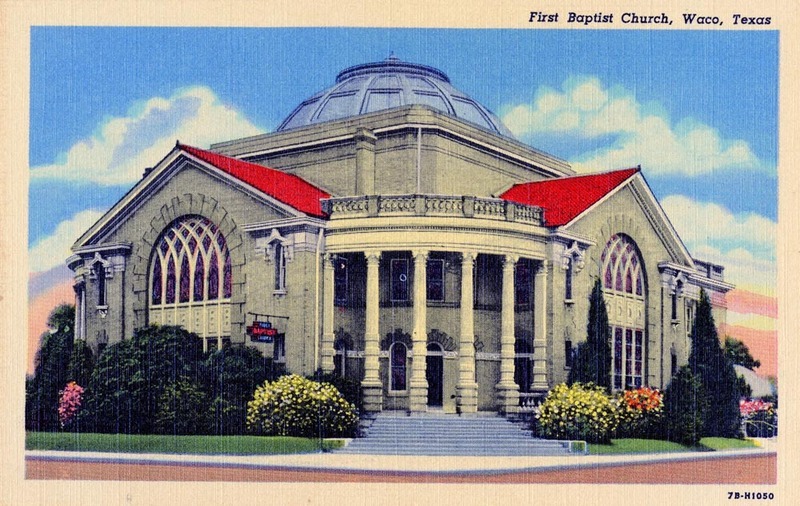 In 1883, the First Baptist Church of Waco was invited to attend the Southern Baptist Convention in Richmond, Virginia, for the first time. 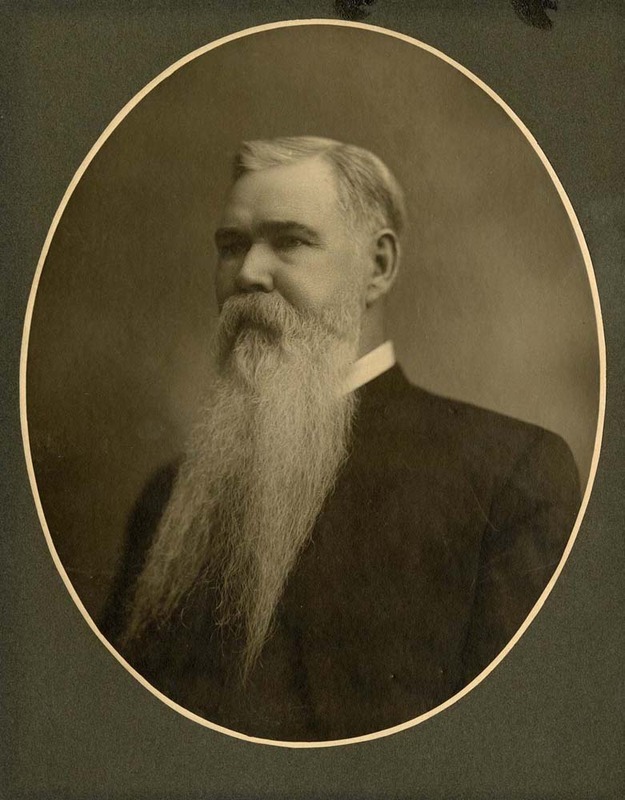 Carroll served as pastor at First Baptist until 1899, when he was called to serve as a secretary for the Texas Baptist Education Commission. In 1915, First Baptist Church’s longest-serving pastor, Dr. Joseph Martin Dawson, began his tenure. Dawson primarily focused upon social issues, as well as the church’s budget. During construction of the new church in the late nineteenth century, the church had incurred a significant amount of debt. Dawson worked to eradicate this, focusing on the budget even during the Depression, sacrificing his own salary in order to save the church money. During the Southern Baptist Convention’s 75 Million Dollar Campaign from 1914 to 1924, the First Baptist Church was assigned to raise $200,000, the largest portion given to any church. Dawson often preached about social justice issues such as racial and gender prejudice, as well as about the separation of church and state. In addition to his position as pastor of First Baptist, Dawson held many other leadership positions in the Baptist community. For instance, he served as the president of the Baptist General Convention of Texas in 1922, the chairman of the Southern Baptist Committee on World Peace in 1945, and the chairman of the Executive Committee of the Southern Baptist Convention from 1945 to 1946. 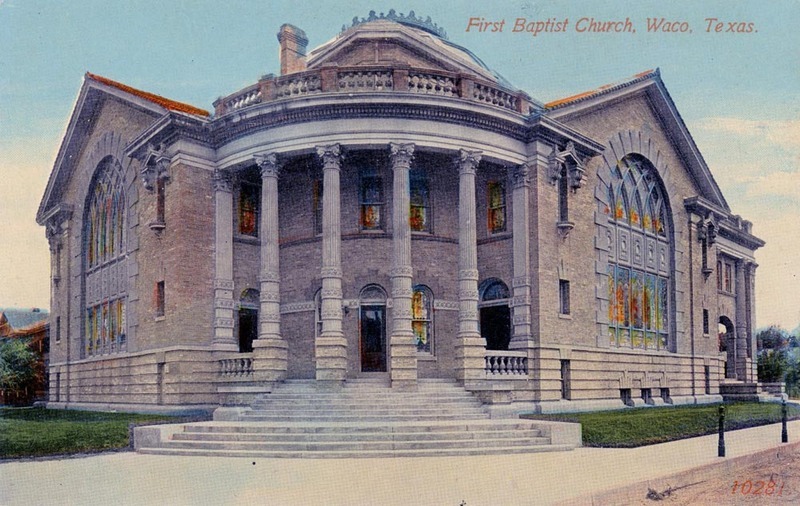 First Baptist Church of Waco was highly involved with the establishment of quality education in Waco. It has been credited with the establishment of the Waco Classical School, which later became Waco University. This school was the first coeducational university in the South, and the second in the United States after a department for girls was added in 1866. 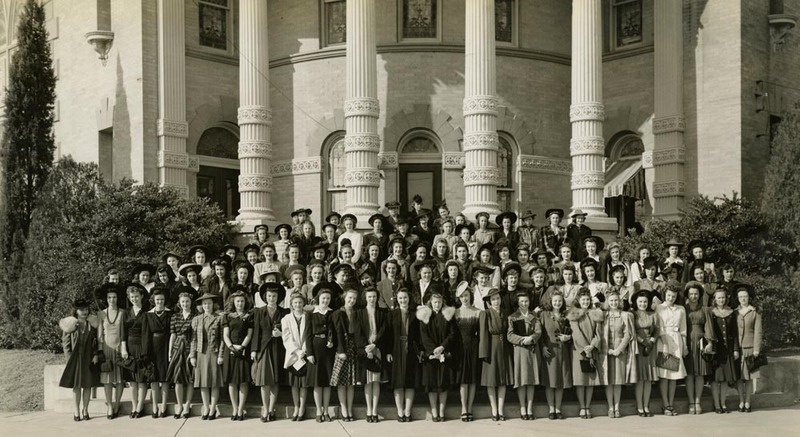 In 1886, Waco University merged with Baylor University. 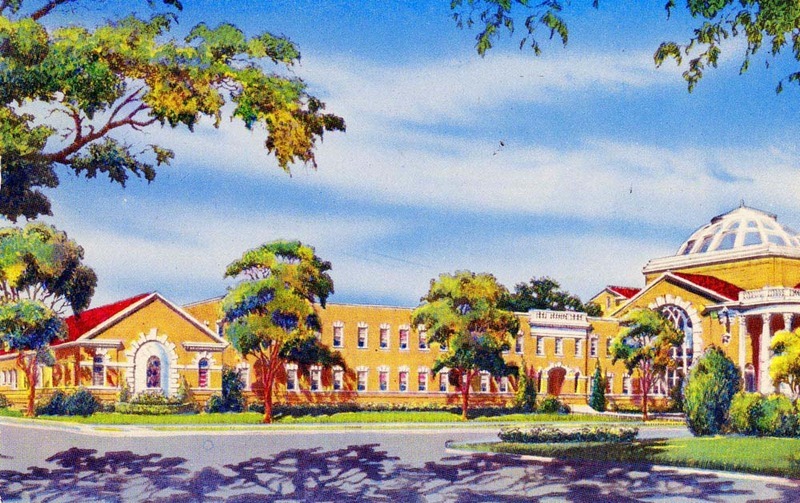 First Baptist Church also aided in the creation of the Southwestern Baptist Theological Seminary in Fort Worth and the George W. Truett Seminary located at Baylor University. The church also contributed to the founding of the Hillcrest Baptist Medical Center in 1919. Today, First Baptist Church continues to serve the Waco community through its dedication to worship, social justice, and commitment to higher education. 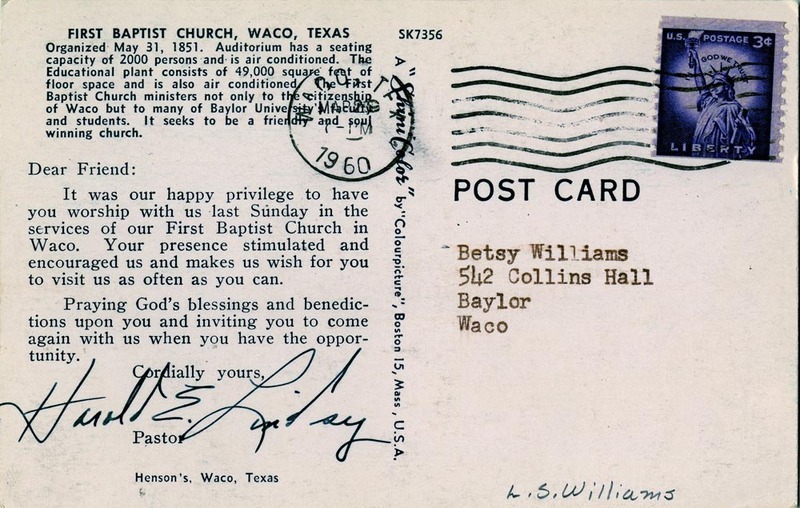 Baylor University and First Baptist Church have retained a strong relationship since 1886 through Baylor’s many students, administration, and staff who worship at the church. The church continues its legacy of supporting the Waco community through ministries which aid groups such as Waco’s schoolchildren, disabled, and low-income families. 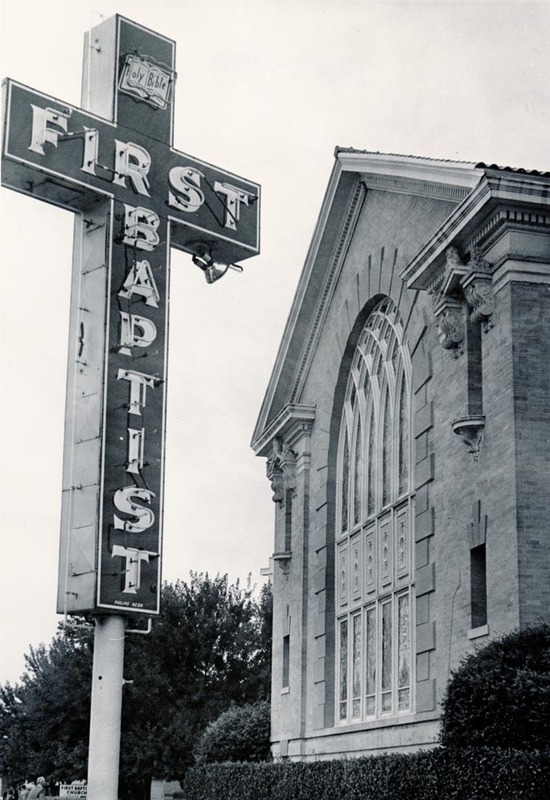 George Graves and Amanda Sawyer, “First Baptist Church,” Waco History, accessed April 23, 2019, https://wacohistory.org/items/show/18. "Baptists in McLennan County. "In Handbook of Waco and McLennan County Texas, edited by Dayton Kelley. Waco: Texian Press, 1972.First Baptist Church. Pamphlet on its history and symbols. Circa 1970s. Housed in Texas Collection vertical files, Waco, TX.One Hundredth Anniversary, First Baptist Church, Waco, Texas 1851-1951. Waco: First Baptist Church, 1951.